Our Office is Driver Helpful! Get your next DOT Physical Exam at our truck driver helpful and convenient clinic located in Carrollton, KY. Need your DOT Physical Exam Today? Same day appointments are routine, just give us a call. We know your time is valuable so we do our best to get your in and out quickly. Our office also offers DOT Drug and Alcohol Testing and a random drug testing program. Dr. Kates opened his practice in 2001 and serves the surrounding counties of Carroll, Gallatin, Owen and Trimble. He expanded his practice in 2008 to serve commercial truck drivers and motor carriers. With his extensive knowledge of the DOT Physical exam medical guidelines, let Dr. Kates steer you through the DOT physical exam requirements so you can Keep on Truckin’. Looking for a DOT Physical Exam, CDL Physical Exam, or a School Bus Physical in Carrollton, Kentucky? You’ve come to the right place! Dr. Richard Kates graduated from Cleveland Chiropractic College in Los Angeles in 1997. He practiced in California for two years before moving to Kentucky to be near family. He opened his practice in Carrollton, Kentucky in 2001. Some of the services offered are DOT and NON DOT drug testing and alcohol screening. 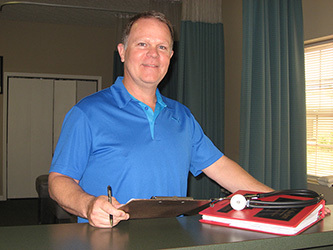 He is a DOT certified medical examiner performing both DOT and NON DOT physical exams. He currently lives in Carrollton with his wife and four children.